Here is the next video in the Wild Card Video Series. Today we are using the "Stitched Card" on page 35 of the handbook. Enjoy! For those of you who want to play along, I've added a Mcklinky below. Create something using the Stitch Card from Wild Card and link it below. Can't wait to see what you make. Love your videos-they are so helpful and are a great place for me to find new creative designs! Thanks for al your work. Love this card. So simple, but so adorable and elegant! So glad you are doing this series. Thank you! Love this card. Super, super cute. I would've never cut this card had I not seen your video! Thanks! 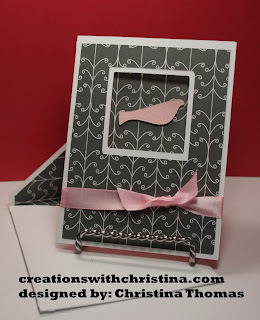 Christina, beautiful card! Did you cut this at 3 1/2 also, like the on your instructional video? I can't wait for the next card. Thanks so much. I have this cartridge and you are inspiring me to use it more. That's a good thing. Love the card. Love your VIDEOS!! I'm always checking everyday for videos! You are making me want this CART! I"m on a scrapbooking/cardmaking ban! Love your videos and all the great ideas. I need to get my WC out and make some cards now ! Love all your videos, especially this series you are doing on the Wild Card cartridge. I didn't think I needed this cartridge, but now I'm not so sure!! forgot to ask- what size did you cut this card at? Love this series. I am just learning about my E and purchased the wild card cart so this really helps me. Thanks. This is my favorite so far. I'm going to make it tonight for my Mom's birthday. Thanks so much! What a beautiful and simple idea. now I can see using this card from my cart. Never knew about the slot punch use either! You only have one to go and i just found you. I have a lot of catching up to do. Boy am I enjoying your videos. You do a wonderful job. Thanks for explaining how to use everything so that I (and others) can understand what to do.